This week’s assignment was to choose one article to summarize and analyze. Ingersoll, R. M. (2001). 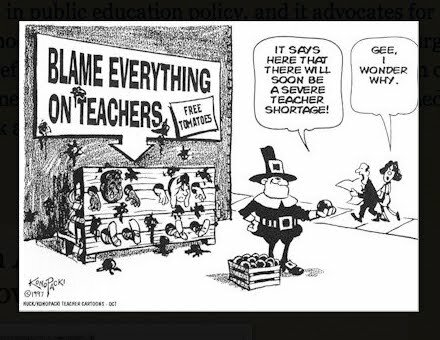 Teacher Turnover and Teacher Shortages: An Organizational Analysis, American Educational Research Journal. 38(3): 499-534. Having not yet taken Intro to Quantitative Methods, I still feel like I don’t quite grasp the full picture of articles like this because I don’t understand all the methods, but it helps that the article’s argument is clear and laid out logically from the literature review. Ingersoll articulates how his research is a departure from what has typically been done, which has been studies of the characteristics of teachers, versus a study from an organizational perspective. Essentially, he asks whether there are organizational conditions of schools associated with turnover. He uses data from the Schools and Staffing Survey (SASS) and the supplement, Teacher Followup Survey (TFS). Importantly, the TFS is a subset, those who had moved from or left their teaching jobs, were contacted after 12 months later to fill out a second questionnaire, along with a representative subset of teachers who stayed in their teaching jobs. Hiring difficulties were not primarily due to shortages in qualified teachers. Private schools have higher turnover rates than public schools. Predictors of turnover, after controlling for teacher characteristics, are likely to be teachers under 30 or over 50. In public schools, higher raters of turnover in high-poverty schools as compared to more affluent schools. In particular, I liked the approach he took of distinguishing between “movers” and “leavers” because both have an impact on the schools they leave. I will say that quantitative articles always leave me hanging when they make interesting conclusions: but did you talk to any teachers? It feels like a first step in the study but an incomplete story in the process of understanding what is happening. I thought the contrast between large urban public high schools and small private schools was interesting. Maybe that made the best story in the data? From my experience working at a small independent school (<300 students), our salary scale was significantly less than public schools, which surprised many people. Furthermore, it is only recently that there has been a move amongst independent schools to publish a salary scale, so I think wonder how that factors in, when you do not actually know how much you will be paid if you stay. There was definitely high turnover, with a lot of teachers like me, hired with little teaching experience and no certification. On the other hand, when I worked at a larger independent school (~800 students), there was much lower turnover and many more career teachers who had maybe worked at other independent schools, but who knew they would always be teachers. We also had a higher salary scale, though still not equal to public schools and the benefits were certainly not commensurate. Ingersoll’s explanation of how the tight community and coherent vision of a small private school may actually induce more turnover because those who disagree might not feel as welcome was really interesting to me. For me it underlines the importance of diversity at the faculty level, where differences are genuinely valued, which I think has to be in place for it to be something the students learn. The contrast, the large public high school, I think would be a hard place for me to work where you have balkanization of different groups because they disagree or because they find the people they get along with. Another issue that none of the three articles mentioned was career trajectories for incoming teachers. That was something that I often spoke about with other new, young teachers. There was a sense that things would never be different: you would just show up to your classroom and teach kids all day every day for the rest of your life. As we’ve been told to be lifelong learners and always innovate, this felt like it wasn’t enough, but there’s no path for how your career might progress. Certainly not like in high education where you have the 3-year review then tenure and different titles of distinction as you go along. At my school, you could become a department chair, but that seemed a mixed bag, as we read about last week, where you have more responsibility but not necessarily the power to change anything, or you could become an administrator, which not everyone is cut out for. I never wanted to be a principal because it seemed to be so little about learning and so much more about parents and budgets. Ingersoll does point out that teaching at a large public high school may offer more “career options,” but he doesn’t elaborate on what those might be. Also not mentioned by Ingersoll, that inexperienced teachers who start teaching in private schools and sometimes at charters are not required to have a teaching license, which means they didn’t go to school to be a teacher and have invested less in teaching as a career path and probably means they are not as well equipped to start teaching. One final note on this, I think it would be an interesting qualitative study to explore what young teachers do after they leave, especially those who leave after 3-5 years. The reality is that for a lot of teachers of my generation, they may want to pursue other career goals and trends seem that they may have many careers over their lifetime. Ingersoll talks about how organizational factors were rated by teachers who left, but I would be curious to compare the ratings of those factors by the teachers who stayed. Is it the teachers who rated them low left or did all the teachers at a particular school rate them low? Was it a particular factor that was different for the movers or leavers? Another article on this topic that I like, which builds on Ingersoll’s work, is by Myung, Martinez, and Nordstrum (2013) called A Human Capital Framework for a Stronger Teacher Workforce, a white paper published by the Carnegie Foundation. What I like about this article is that it focuses on four dimensions: acquire, develop, sustain, and evaluate. It is a holistic or systems approach to the teacher workforce, and they list promising practices done by different districts or organizations for each of the dimensions. They specifically address things like induction programs or career trajectories.